Years ago, I thought that if I ever attempted to write a novel, I would describe a future dystopia in which the ruling elite were those who made and understood computers and the rest of us would be techno-klutzes like me who wouldn’t recognize a byte if it bit me on the behind. Now, George Mason University economist Tyler Cowen is making a splash with his new book “Average Is Over.” The book is a nonfiction prediction of an American society comprised of 10 to 15 percent highly prosperous achievers and a “permanent underclass” dwelling in shantytowns and subsisting on beans. With all due respect to the highly erudite Cowen, this is not the natural evolutionary future of market economies. Let me emphasize that this is not a review of Cowen’s book, but an attempt to show why his gloomy vision is flawed in its very conception. This may be the gloomiest pronouncement by an economist since the Malthusian/Ricardian “iron law of wages” mistakenly posited that laborers would inexorably have to settle for subsistence wages. Cowen’s book may provide fodder to the left’s incessant refrain “the rich are getting richer while the poor are getting poorer,” but to regard this mantra as true requires an abandonment of both economic logic and history. How are the wealthy to gain their vast riches without selling their products to the masses? Even in the much-maligned “Gilded Age,” when the Carnegies, Westinghouses, Fords, and Rockefellers earned their vast fortunes, the standard of living of the vast majority of working Americans also rose. Indeed, the two phenomena were, and still remain, interdependent. The billions earned by successful entrepreneurs mirror the billions of dollars of value they provided to the mass of consumers. We should hope that 10 to 15 percent of our population become wealthy entrepreneurs, a far higher percentage than was the case during the Gilded Age, because they will uplift standards of living far higher than was possible with the relatively small number of entrepreneurs in the past. The growth in the number of wealth creators will tend to raise wages rather than lower them. Andrew Carnegie and other early entrepreneurs enjoyed a buyers’ market for labor due to the large supply of labor relative to the capitalist demand for labor. As economic development progressed—that is, as more capitalist entrepreneurs wanted to “exploit” workers and provided them with the capital that increased their productivity—the law of supply and demand swung in favor of workers, and the affluent American middle class was the result. With more “exploiters,” the potential for higher wages in the coming decades is enormous. 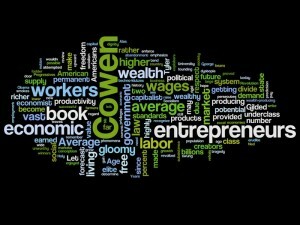 Alas, Cowen appears to have channeled Ned Ludd (see: Luddism), who revolted against technology. Holy smokes, should we now undo the Industrial Revolution? Machines have been raising the productivity of labor in the U.S. since our founding, enabling us to feed ourselves and manufacture a wide variety of products with ever-smaller numbers of workers. Rather than turning waves of unemployed workers into paupers, the country grew richer from all the additional goods and services that erstwhile farmers and shop workers produced. Is there any scenario under which Cowen’s gloomy forecast could come to pass? Yes, but such a tragedy would have political, not economic causes. In a free market, the notion of a permanent underclass is absurd, because, as millions of earlier Americans have proved, freedom includes economic opportunity and opens the door to upward social mobility. Only when the state rigs the system to determine economic winners and losers—as in feudalism, mercantilism, and socialism—do class divisions become rigid. Capitalism remains the best antidote for such social pathologies. Only when the state crushes wealth producing entrepreneurs do job opportunities dry up and incomes stagnate. This is our current political situation. Progressives have made idleness pay more than employment, engaging in unremitting harassing of and hostility toward profit-seeking (i.e., wealth-producing) business. President Obama has favored the governing elite while attempting to divide us into two Americas. The last comment I’ll make about Cowen’s book is that it’s a shame he has been taken in by the macroeconomists’ and socialists’ obsession with “average.” Socialism indeed seeks to make citizens average, but at the cost of freedom, dignity and prosperity. The only “average” that government can enforce is to average down standards of living. That won’t happen to us if we remember to respect, appreciate and value those among us who excel at producing wealth. Average is worse than over-rated. It is unworthy of our aspirations. Let us exalt excellence. What we need to do today is to dismantle the system of privileges that has supplanted the rule of law in America and has corrupted free enterprise. Big government cronyism has the potential to divide us into the nation that Tyler Cowen envisions in “Average Is Over.” Alternatively, genuinely free markets under a government that protects, rather than persecutes, wealth creators would blast Cowen’s gloomy forecast into oblivion.